I remember talking to Wayne DeMilia in one of our numerous discussions about the extent of content I would have in Volume II regarding these two decades. He said, "You can’t cover those 20 years in just one volume!" I had gone through a bit of this with Dr. Mauro Di Pasquale a few years earlier when he told me that my project would be two or even three volumes. I laughed at three volumes at that time. However, his words were ringing in the back of my mind when Wayne, as adamantly as Mauro was, made the same proclamation. I thought I'd best stop and conduct a word count to see where I was sitting in terms of size at that point. Sure enough, Wayne was right. There was no way I could fit what I had and what I needed to add in only one more volume. So, I broke Volume II off with just the 1970s. However, I then became concerned about having enough data to bump that one decade alone up to at least the size of Volume I. I figured I could put one or two of the four women's chapters in there since I already had them drafted for the 1980s. When I went back to pick up on the Arthur Jones chapters, it wasn't long before I realized I wouldn't need any padding from my 1980s material as Jones was turning into a book within a book. By the end, the publisher had a number of difficulties with the size of the publication coming in at 728 pages in total. In fact, it wouldn't fit into their standard format and the margins had to be adjusted. From July 1, 2011 right through to October, I worked every day, all day on the publishing preparation process and that was stressful. The stress continued until the book's actual release. I had a lot of help from my friend and editor, George Harrod and it gave him his share of stress as well. Getting data also proved to be tedious, but that was the case for both volumes and will no doubt be similar for the third. Even just covering one individual such as Jeff Everson was painstaking at times since I had to go through dozens of emails putting together what all he had done. Probably neither one of us realized at the time how much he was involved in before he even went to the west coast. It is a very informative chapter called, "Do You Know the Way to San Jose?" It was also tricky covering the homosexual and gay hustling underpinnings of bodybuilding and to put it in proper perspective. However, I needed to cover all aspects of the game to be taken seriously. My friend whom I often confided in, Steve Speyrer, probably said it best when he told me, "Randy, I do like what you are doing and how you are diving deep into everything, but without sinking the ship!" He was correct. I had to be careful not to go so far as to break the tone and pattern I had set in Volume I. A: Although I just mentioned the tedious aspect of collecting data, it wasn't as bad for the second volume. I liked writing this one more because I had so much more access to first hand information, a good deal of it never disclosed before. I also had others doing leg work for me such as Ron Koeberer, Ken Sprague, Jeff Everson, Boyer Coe, Wayne DeMilia, and others. These men were all knowledgeable in their fields, sincerely interested in what I was doing, and were in possession of their own documentation that helped nail down timelines. Volume I spanned primarily the first 70 years of the 20th century with some historical background dipping back three to five thousand years ago, then giving additional attention to the 19th century. The scope was broad since I was setting the stage for bodybuilding's Physical Culture roots and how it was intertwined with the struggling fields of healing, the burgeoning nutrition knowledge base and exploding food industry. On top of that was the birth and growth of modern bodybuilding and how it, too, developed its warring factions. Volume II was zeroed down or we might say zoomed in on just one decade: the 1970s. There was so much in the Iron Game and our modern Western culture that changed in that decade following the turbulent 1960s. I primarily focused on the emergence of bodybuilding along with all of its tools of the trade and stereotyping into a piece of society's mainstream. I always wanted to learn more about that period of time and what Jones was up to and I didn't care how much room it would take. I knew I might be criticized for the amount of material expended on this subject, and I have by some, but I chose to do so. Arthur was a huge impact player of the 1970s with his training ideology and equipment technology. He was the foundation from which most all other machines would derive. Ron Koeberer really stepped up here for me. Ron is a professional Hollywood photographer and was a friend of Arthur's going back to the 1970s, but was closer to Arthur and his wife, Inge, in Arthur's retirement years. He spent a lot of time looking after Arthur during Inge's illness and after her death. Ron was in possession of a lot of material few had seen before. He also had contacts for a large number of people who had interacted with Arthur over the years and this included some of Universal's former personnel. He had tried to make contact with a few of them over 10 years ago with limited success. Some just wanted nothing to do with Jones or to speak at all about their encounters with him, at least while he was still alive anyway. A: Well, this is kind of a double-edged question. The initial response from those who have read it is much better than I thought it would be. The first Volume had garnished a large number of fantastic reviews with many calling it the best book ever written on the industry. Now, you would think that hearing things like this would be all good and it was, but it also stress me to some degree. Coming down the pike I was worried that Volume II wouldn'’t stack up. There are still some who like Volume I better probably, including me. However, more are actually liking Volume II more than my first. Paul Solotaroff of Men's Journal called Volume II the "definitive" book on the industry. I have received already a number of great reviews from Joe Roark, Brian D. Johnston, John Kiiha, Mike Brown, David Chapman, Jim Bryan, and a number of others. They are posted on my site with the endorsements. 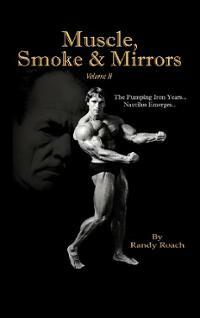 Muscle & Fitness, Planet Muscle, Iron Man,and the UK's Health and Strength all gave me really great reviews. However, that all came early then it just seemed to drop off the map. None of the bigger, commercial bodybuilding websites have shown any interest in it until now and I do thank you for this; it is greatly appreciated. Even Boyer Coe has told me more than once that he can't understand why there seems to be a lack of interest. Perhaps the price or the sheer size of the book has been a detriment, I don't know. What is surprising though is that Volume I is still selling neck and neck with Volume II and that book has been out since June of 2008, three and a half years before Volume II. I really thought Volume II would be more popular due to the era of the 1970s. A: Well, I figured if the industry is not interested in its own history then I would write on a subject that does definitely captivate their total focus - how to build muscle with or without drugs! It is primarily aimed at the natural bodybuilder, but any steroid using athlete would benefit tremendously from this as well. I have been collaborating on this smaller book project with Josh Trentine of Renex on a book on raw food eating and bodybuilding. Josh is a 2006 Natural Mr. USA who just competed 20-25 lbs heavier since turning to primarily raw foods in his diet. And Josh is 42 years old. I have been experimenting with training and raw diets for almost 12 years now and we have some good stuff.